November 3, 2013  South Asian communities around the world are celebrating good over evil, knowledge over ignorance, light over darkness. 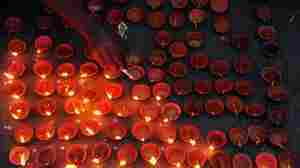 Sunday is Diwali, the Hindu Festival of Lights. The holiday isn't well-known in the U.S., though, so families rely on themselves to keep the tradition alive. September 22, 2005  The Senate Judiciary Committee votes to approve Judge John Roberts' nomination as chief justice of the United States. The panel's 13-5 vote clears the way for a full vote on the Senate floor. Lakshmi Singh reports. May 6, 2004  President George Bush says publicly he is sorry for the abuse Iraqi detainees have suffered at the hands of U.S. troops. He made his comments to the press following a White House meeting with Jordan's King Abdulllah. Hear NPR's Lakshmi Singh. October 17, 2002  Lakshmi Singh reports on the school lock-downs in the wake of the sniper shootings around Washington, D.C. Bus stops that once served dozens of children are now empty, and the sounds of after-school sports are absent from many neighborhoods. The cancellation of outside activities at schools throughout the region has been especially frustrating for teachers, kids, and parents, but no one wants to take any chances.